If you like this sort of epic metal then this album is a fine example. 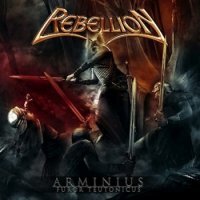 With a name like Rebellion it seemed only a matter of time before there would be a change of personnel in the German metal band’s own ranks. This particular rebellion was led by original guitarist Uwe Lulise (not Huey Lewis!) who was involved in a motorcycle accident back in 2008 and despite an EP since then he decided to move on at the end of 2010 with drummer Gerd Lisching and second guitarist Simon Wenzel also throwing in their horned helmets and riding off into the sunset. 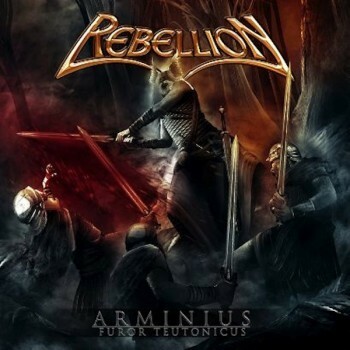 The good news for Rebellion fans is that while there might have been a couple of line-up changes, their distinctive brand of metal is still identifiable as the band that went before. So, as on previous albums you’re transported to a muddy battlefield where the smell of blood is still fresh and the vainglorious warriors sing of their heroic exploits. They still occupy the plot next to Grave Digger. The continuity of what the band are now and what went before is thanks to singer Michael Seifert who takes a lot of care over the background of the lyrics, delving into history and folklore. After their recent Viking trilogy this new one is set in what is now Germany 2,000 years ago when men were men and the women were pretty manly too. It centres around Arminius and his battle in the Teutoberg Forest against the Romans. It’s a sensitive subject as National pride in German war heroes has, understandably, been something that’s been played down in recent history. Seifert’s vocals are gruff which suits the music and he pulls out some sing-a-long choruses abetted by some chest-beating harmonies. His performance is suitably stirring; enough to rally the troops to his cause. After ‘Rest In Peace’ which opens the album atmospherically, setting the scene, ‘Ala Germanica’ is driven by thrashy metal riffs and it whips out the first of a number of rousing anthems. ‘Prince Of The Cheruscer’ does the same though less convincingly and ‘Dusk Awaiting Dawn’ midway through puts its head down for some serious metal riffing, demonstrating what the new boys Oliver Geibig (guitar), Stephan Karut (guitar) and Matthias Karle (drums) can do. ‘The Tribes United’, ‘The Ghost Of Freedom’ and the title track are also strident songs with enough muscular riffs and memorable battle hymns for you to feel this is album is less like having survived a battle and more like living through a long, but triumphant war campaign. This is escapist metal, that like a Warhammer game will transport you to another time and make you want to swing a sword round your head and lop a few foes heads off before you return to humdrum real life. Like those games, it appeals to a niche market and won’t be for everyone but if you like this sort of epic metal then it’s a fine example. Despite the reshuffle in the Rebellion camp, they’ve come out battle ready and they declare loudly that even after over a decade they’re still up for a fight.